How do you know it's a blackberry? The blackberries have many uses, not just limited to the fruits themselves. The leaves can be dried completely and used as a tea. The plants can be used as hedges along property boundaries. The fruits of course are delicious in many forms including jams, preserves, in or on pancakes, muffins, breads, ice cream or frozen yogurts, and many other edible treats. Native peoples in various parts of North America once managed the landscape in favor of blackberries, using fire to keep areas open and create the disturbed habitat edges where blackberries thrive. For more information check out some local field guides or take some edible plant classes. 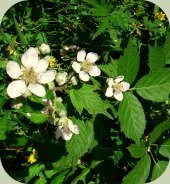 For more information on the care of blackberries check out Arbor Day's blackberry page. 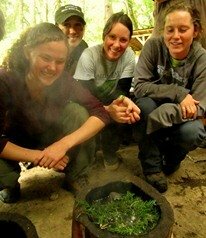 Learn more about wild edible and medicinal plants at our Plants Courses.